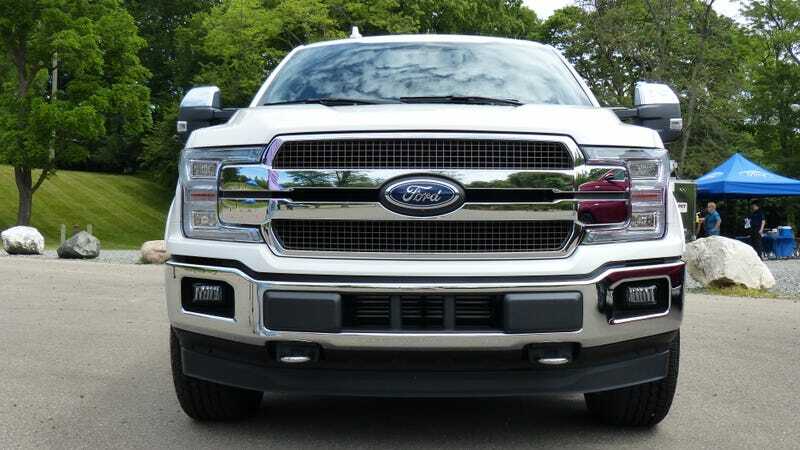 The refreshed 2018 Ford F-150 will offer a new engine, more horsepower and torque from existing engines, and more gears in its transmissions. Here a breakdown with the numbers. Starting this fall, Ford will offer five engine options in its new 2018 F-150: a new 3.3-liter naturally aspirated V6, modified versions of the outgoing 2.7-liter EcoBoost V6 and 5.0-liter V8, and the same 3.5-liter EcoBoost V6 and 3.5-liter high-output EcoBoost V6 from 2017. All of those may sound familiar except the 3.3, which is a reworked version of the current base engine, the 3.5-liter naturally aspirated six. The new engine now gets both port and direct injection, working under low engine speeds and loads and high engine speeds and loads, respectively. The dual-injection system works with modified intake runners and a higher compression ratio (12:1 versus 10.8:1) to net the new 3.3-liter 290 horsepower at 6,500 rpm, compared with the outgoing 3.5-liter’s 282 horsepower at 6,250 rpm. Torque figures also go up and come lower in the rev band, with the new 3.3-liter making 265 lb-ft at 4,000 rpm compared to 253 lb-ft at 4,250 rpm from the 3.5. The 2.7-liter EcoBoost also gets dual port and direct-injection, which bumps its torque figures up by 25 lb-ft from 375. And like the 3.3-liter, the 2.7-liter’s torque comes on sooner, peaking at 2,750 rpm compared to 3,000 rpm from last year’s 2.7. Horsepower remains 325 at 5,750 rpm. The 5.0-liter also gets the same dual-injector technology, as well as a spray-on bore liner like the one found in the GT350 (for weight savings). Total horsepower is up from 385 to 395 horsepower, both coming in at 5,750 rpm. Torque is also up from 387 to 400, both at 3,850 rpm. Ford’s 10-speed automatic will be standard across the range, sans in the 3.3-liter base trucks. Perhaps even bigger news is that all engines minus the new 3.3-liter base engine come with Ford’s new 10-speed automatic transmission. The 3.3-liter sticks with a six-speed automatic as the “value transmission.” In addition, for 2018, all five engines come standard with Auto Stop Start. This all sounds like good news; the cheapest engine now makes 8 horsepower and 12 lb-ft more than the outgoing one, the 2.7-liter EcoBoost adds 25 lb-ft of torque, the 5.0-liter gets 10 ponies and 13 lb-ft, and all engines but the 3.3 get more gears. Still, two questions remain: how do these changes affect fuel economy, and more importantly, how much horsepower and torque will the new diesel make? We’ll learn the answers to both questions later this year (the diesel model will launch late for 2018), but Ford says you can bet their diesel’s power and torque figures will be competitive with the Ram’s 3.0-liter EcoDiesel.